From simple ball bearings to complex turbine airfoils, traditional NDT methods inspect only for known issues, and in many sampling practices, may test less than half of the parts. Defects that slip through the cracks lead to costly failures and loss of confidence. Adding Vibrant’s revolutionary PCRT testing to your NDT inspection routine allows you to quickly test all parts and immediately identify potential quality issues. Unlike standard NDT, which can many hours for a single part, Vibrant tests parts in a matter of seconds, comparing data from the whole part against all others. Comparative analysis quickly identifies parts out of conformity, even on microstructural and chemical levels. We deliver game-changing reliability improvements while eliminating costly destructive testing, helping you to salvage parts with remaining service life, and reducing expensive downtime caused by avoidable part failures. Power Generation components are typically too large and thick for traditional X-ray and Ultrasonic inspections, often leading to inferior and reduced inspections. Resonance allows every part to undergo stringent whole part inspections, allowing you to achieve higher quality, safety and risk reduction. 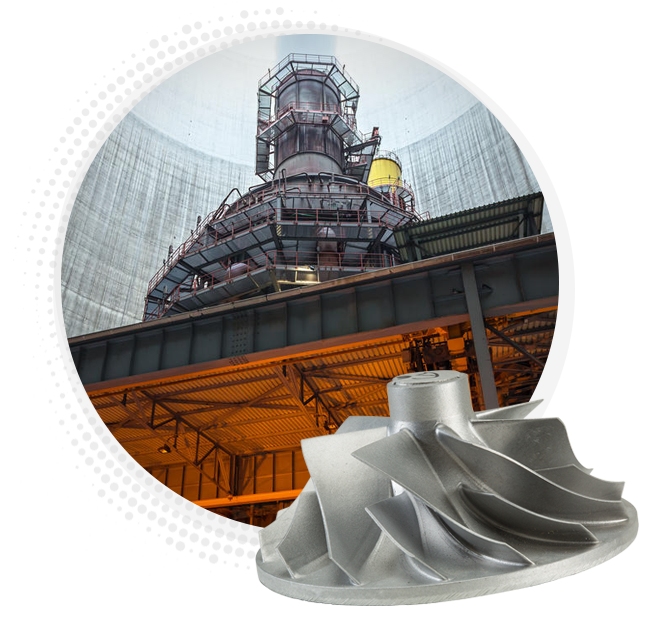 Vibrant’s PCRT successfully tests all standard power generation metals and alloys as well as a number of advanced materials. PCRT offers the peace of mind that all parts are defect free. Learn more about how Vibrant can reduce your costs and risk in the power generation industry with our advanced resonance testing.